FOR the second successive season Havant look like narrowly missing out on a London one south play-off place. Though they only trail second-placed Medway by two points with two games left to play the Kent side are firmly in the driving seat. Head coach Will Knight knows Havant must achieve bonus point wins in their final two games, starting at Chobham on Saturday. Even then Medway will need to lose one of their final two games, both against the bottom two sides in the league. Knight said: ‘It is frustrating. ‘Once again we can look back on a couple of games that got away from us. ‘The game at Chichester at the start of the season and Brighton just before Christmas are prime examples. ‘After those we wondered whether they might come back and bite us. ‘It looks very much as though that is going to be the case. Havant are sticking with the same front five that helped thrash Thurrock in the last game. Mitch Goldring and Tristan Trehan come into the back-row. In the three-quarters there is a return on the wing for Jerome Rudder and Luke Warrington at full-back. Jake Reynolds and Reuben Knight stay as the half-back pair with Joel Knight and Scott Morris in the centre. There is also a return for Ben Brierley on the wing. Will Knight knows his team can’t do anything about how their rivals play in the final two matches. 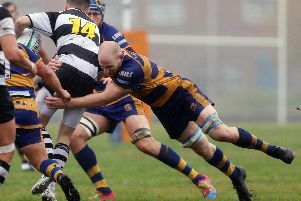 But they must at least ensure they don’t hand Medway the position on a plate but faltering in their own fixtures – they have to be there if a surprise happens. ‘All we can do is keep winning and maintain the pressure on Medway. Then if they do slip-up we will be in a position to take advantage of it. ‘We are playing very well at the moment. ‘It is important we keep getting ourselves up, put in a performance and do the job. ‘On paper Medway should win both their remaining games but stranger things have happened. ‘They are both Kent derbies and I am sure Gravesend and Maidstone would love to upset them.